In the last Safe Routes post I introduced you to bicycle trains and offered tips on how to get one started at your child’s school or in your community. One of the most important elements of starting bicycle programs is teaching children safety skills. 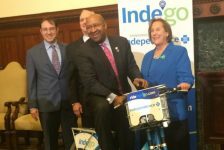 At Safe Routes Philly, we’ve put together a comprehensive program to teach walking and biking safety and get children active on two feet and two wheels. Safe Routes Philly staff train School District of Philadelphia Health and Physical Education teachers. 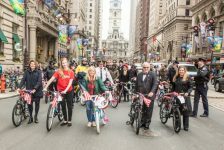 Since 2010, Safe Routes Philly (SRP) has trained over 200 Physical Education and Health teachers in the School District of Philadelphia to implement bicycle and pedestrian safety lessons. When developing the the curriculum, I had to keep in mind the time and resource constraints of public school teachers. That is why SRP lessons are concise and can be taught in a variety of settings. Safe Routes Philly’s core lessons consist of a 45-minute health lesson, best suited for a classroom setting, and a 45-minute PE lesson, best suited for a gymnasium or other large open space. High school students at Girard Academic Music Program used Safe Routes Philly curriculum to teach 5th graders about bicycle safety. 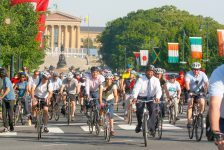 Safe Routes Philly is available to train teachers and program staff to deliver these safety lessons. Activity books may be available for programs that work with Philadelphia youth. Contact [email protected] for more information.